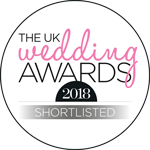 Burgh House has been shortlisted for "Best Historic Wedding Venue" in the UK Wedding Awards! We are delighted to be shortlisted in a category that features so many fantastic historic properties. Show your support for our lovely little house and vote for us here!